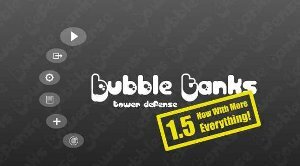 Bubble Tanks is creative Tower Defence (TD) free on line game made by Hero Interactive, LLC, where four types of towers can be upgraded on four different levels and then combined with other towers to make mega upgrade and effect. All towers start from the same initial tower and from there they are upgraded to further tower types. Enemies are coming in different varieties: from flying, ghosts, fast, slow to multiplying and very tough. The main idea is to create paths for enemies with towers that are later upgraded and combined: it sounds easy but there are some stages/levels that are extremely difficult. The game can be paused and muted easily and whole navigation trough game is made easy for the users. All game statistics are displayed at the top of the screen at all times and at the bottom you can see thy type of enemy waves coming. Good thing is that you can play some 60 stages/levels in Bubble Tanks 1 and much, much more in following Bubble Tanks TD 1.5, Bubble Tanks TD 2, Bubble Tanks TD 3 and Bubble Tanks Arenas (BTA). Bad thing is that on the end you may complain on the time spend on this addictive and wonderful game. anonymous: "give us more... more and first on Google Android Play Market and than Apple iOS iTunes iStore iShii..."
anonymous: "is there new version of bubble tanks tower defense games?" Solve this complex math: 1 + 2 = ?